If you live in a house that has undergone a kitchen remodel in the last 10-15 years, chances are you have granite countertops. I have granite countertops. 90+% of the homes I see on the market have granite countertops. As interior design trends go, granite countertops have become as ubiquitous as pastel tiles were in the 1950s. 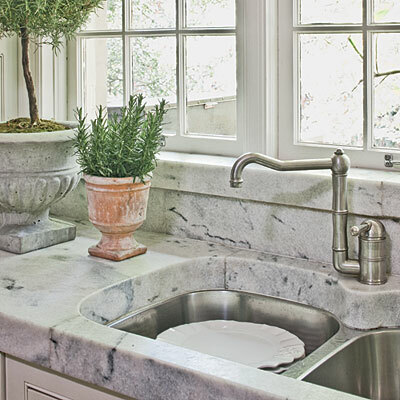 Since about the mid-1990s granite has been wildly popular and for a number of good reasons. It is durable (when properly sealed and maintained), comes in a variety of colors and offers that solid surface functionality we all love (especially after the tiled countertops that were popular in the 1980s). But if you're planning a remodel in the near future, I encourage you to look at solid-surface countertop options beyond granite. Because after almost 20 years of popularity, even the design community has concluded that "granite has been dethroned" which means that having granite countertops in your kitchen may soon look as current as pastel pink tile in your bathroom. I can personally attest to the beauty and durability of soapstone since we used it when we remodeled our house in San Francisco (credit to our interior designer, Regan Baker). It is stain resistant, heat tolerant and IMHO, looks best when honed (vs. polished). Soapstone is a little soft, but scratches can be buffed out with a fine grit sandpaper. Soapstone countertops in our former house in San Francisco. Most commonly known by the brand name Caesarstone (and I've even heard them referred to as "cultured stone") quartz composite countertops offer the look and color variety of of stone countertops with near bullet-proof durability and zero maintenance (no sealing required!). They are most frequently used in modern design, but they come in such an array of colors and stone-like patterns that I predict we'll start seeing them in all types of design schemes in the near future. And as an added bonus, quartz composite is more environmentally friendly than natural stone! Caesarstone countertops used in traditional space. This color is called Wild Ride and has the look of natural stone. Not a fan of design trends and don't want to risk having your kitchen look outdated in 10 years? 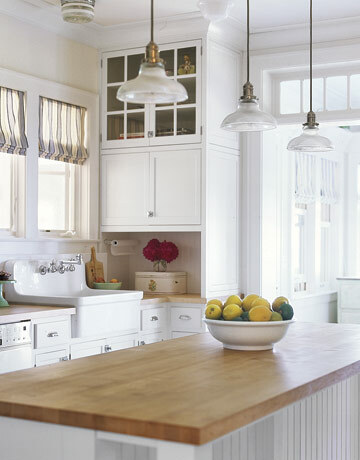 Butcher block is a classic look that's sure to never go out of style. It can be used in both traditional (picture below) and modern (see above shelves by John Boos from my SF kitchen) design. And apart from regularly oiling them with food-grade mineral oil, they are pretty low-maintenance. But remember - just because you have butcher block countertops doesn't mean you can use knives on them! Treat them like any other countertop surface and use a cutting board. If you're into the weathered/rustic look, using salvaged stone or wood for countertops is not only green, it's also a great way to add character to a space. Remodeling can sometimes lead to space looking too slick (like perfectly white sneakers or pair of Frye boots that haven't been broken in yet) and the inclusion of reclaimed elements can temper that and really give a space a sense of life and history. 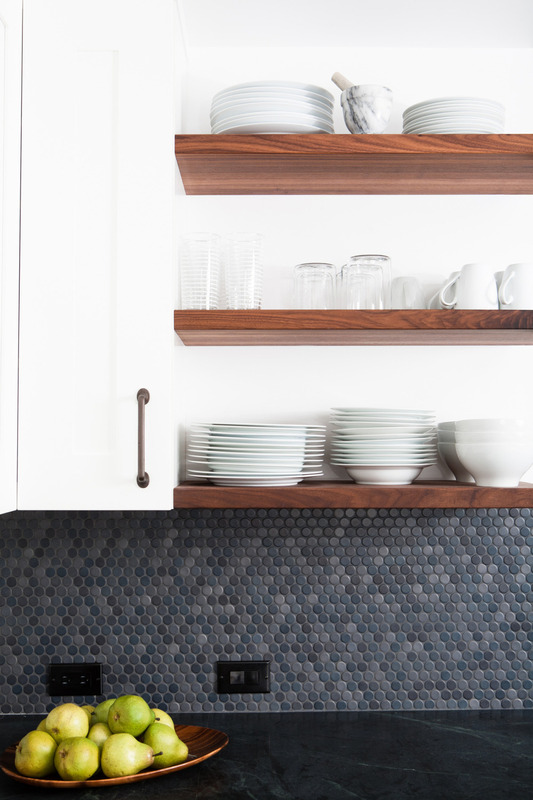 Several tons of old marble blocks salvaged from a historic theater being torn down in Nashville is honed into 3-inch-thick countertops and a herringbone-patterned backsplash.